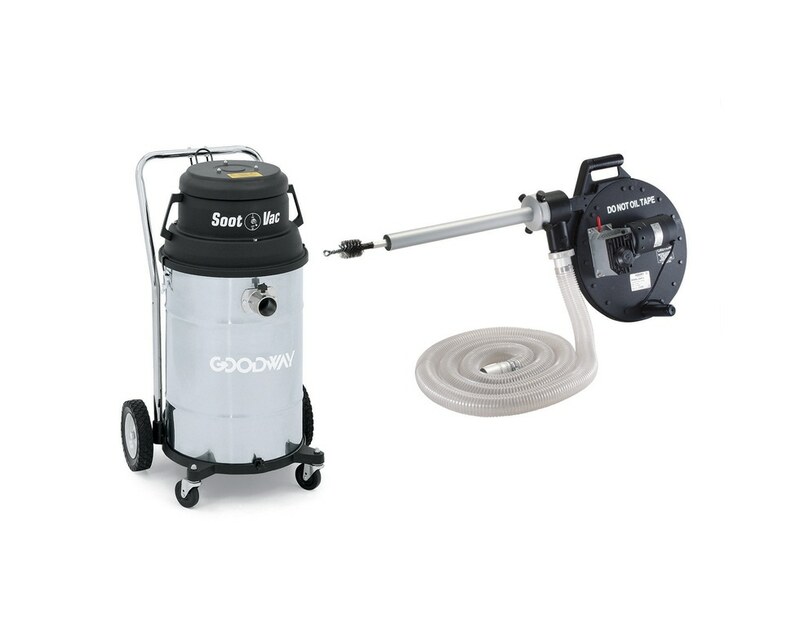 A cornerstone of Goodway, the Soot-A-Matic, is the world's most popular system for cleaning firetube boilers, and this complete kit gives you everything you need on one. The SAM-3 unit is compact, portable and easy to use. One operator can thoroughly clean a boiler in a fraction of the time required by other cleaning methods - all by flipping a switch. Interchangeable bayonet nozzles and cleaning tools are available to fit tubes 1 3/8"-4" (35-102mm) O.D. The SAM-3 use a cleaning tool mounted to the tip of a 26' (7.9m) spring steel tape. A trigger switch controls tape feed. The operator inserts the nozzle into the boiler tube and pushes the trigger forward. The cleaning tool travels the full distance of the tube at more than 3' (0.9m) per second, loosening soot and scale. The operator pulls the trigger back for cleaning tool return and moves to the next tube. The kit simultaneously removes loosened deposits, leaving tubes clean. This kit also includes the GTC-540 industrial soot vacuum and accessories. 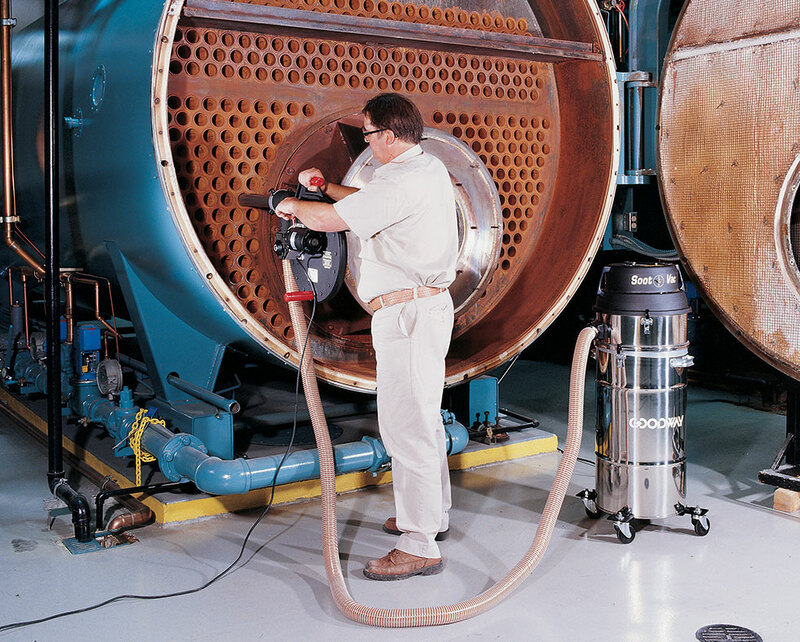 SAM-3 Tube Punching Machine, GTC-540 Soot-Vac Vacuum (specify capacity and finish), 2" x 12' Hose and 18" Straight Bayonette Nozzle Brush. Note: Stainless steel vacuum drum only available in 15 and 20-gallon capacity. Bonderized drum available in 30 and 55-gallon capacity. You must log in to view this document. Log in to your account to view this document. Visit our support section for more information. For Tubes 1" and up. For Tubes 2" (50.8mm) - 2 1/2" (63.5mm) O.D. Goodway's ScaleBreak®-SS industrial descaler is specially designed to safely descale stainless steel surfaces faster than any other liquid descaler on the market. firetubes. And those deposits are tough. They include chemicals, soot, and an ash coating that bakes on like ceramic. Sounds daunting, but it’s not - you just need the right equipment and processes. Don't neglect the basics of boiler safety and maintenance. Get tips and information for developing a boiler maintenance program.